everydaymatters: Stuffed Green Bell Peppers. Joshua bought a cookbook last week and "we" decided to make something out of it. Meaning I made it and he ate it. This is the cookbook he got. 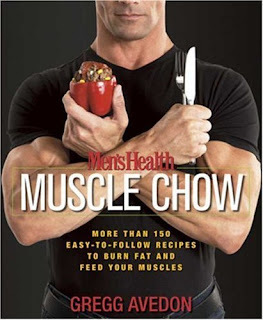 It is for guys who are trying to gain muscle, but basically the recipes are good for anyone. Here is the recipe for the stuffed peppers I made tonight, they were amazing, and I don't even like green peppers. Step 1: Preheat the oven to 425 F. Pour 1/4" of water into a baking pan. Cut off the tops of the bell peppers, then carefully remove the seeds and membranes (pinch them out with your fingers or use a paring knife) and discard. Lightly coat the skins of the peppers with the oil. Place the peppers cut side down into the baking pan. Bake for ten minutes. Step 2: In a large bowl, mix together the beef, egg white, onion, corn, parsley, wheat germ, black pepper, and 1/4 cup of the sauce. Step 4: Bake for 30 minutes. Stir together the horseradish and the remaining 1/2 cup tomato sauce and add a little to the top of each pepper. Bake for 15 minutes longer, or until the meat is no longer pink. Per serving: 217 calories, 27g protein, 16g carbohydrates, 6g, fat, 4g fiber. My take: I made this without the wheat germ. It is in the baking section with the flax seed and stuff like that. It was a little expensive and I wasn't sure it was worth it. Also, I could only find raw wheat germ and I would have had to toast it, and I didn't feel like taking the time. Also, Josh doesn't like horseradish so we went without that I and put extra tomato sauce on the top. Instead of using extra-virgin olive oil, I sprayed the outsides of the peppers with fat-free olive oil spray. I also didn't cut the onion very fine. It was pretty chunky, but very good. I was going to make this with red bell peppers because they are much more nutritionally beneficial, however, one red bell pepper cost $2.08, while one green bell pepper cost $0.48. No comparison. Especially when I was making so many. I doubled this recipe and made eight so that Josh would have some to take to work for lunch. They were really good. Somehow, even though I doubled the recipe, the cooking times were still about right. It's different from anything I've ever made, but I'll probably make these again.